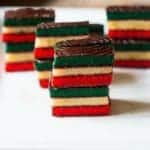 Italian Rainbow Cookies are the popular bakery cookie is a perfect bake at home cookie. Great for Holiday cookie exchange or any day. Always a party favorite! Preheat oven to 350 degrees. Spray 3 9x13 baking pans with non-stick butter spray. Line bottom of each pan with parchment paper and spray parchment paper with spray. In a stand mixer using the paddle (or a large bowl using a hand-held mixer) add in the almond paste and break apart into pieces. Add in the butter and sugar to cream ingredients together, About 4-5 minutes. Add in the eggs one at a time. Mix briefly after adding each egg. Add in the almond extract and salt. Mix another 30 seconds. Add in the flour and use a wooden spoon to combine flour into the batter. The dough needs to be split into 3 equal portions. I weigh the dough and then split 3 even ways. This can be done by the eye as well. Add red food coloring to the first bowl of batter and combine well. Add the green to the second bowl, again a well. Leave the third bowl as is. Spread each portion into the prepared baking pans. Bake about 10-12 minutes. The sides will be slightly brown and a toothpick should be inserted into the cookie and come out clean. Remove from oven, place on cooling rack for about 10 minutes. Remove from pan and place the cakes on the rack to cool completely. On a large sheet pan, place a large piece of plastic wrap (large enough to cover all three layers of cake. On top of that place a slice of wax paper to place the large cookie on so they do not stick to plastic wrap. Invert green layer cookie onto the wax paper and cover with apricot jelly. Top with the plain cookie. Cover plain cookie with raspberry jelly. Invert and top with the red cookie layer. Wrap the large cookie with the plastic wrap and place a cutting board on top of the huge cookie. Refrigerate from 4-8 hours or overnight. Remove from fridge, remove the cutting board, plastic wrap and wax paper. Trim the sides all around to make straight edges. Set cookie aside. Microwave the chocolate pieces about 1 minute. Stir to melt and smooth the chocolate. Or, use a double boiler. Fill bottom pan three fourths full of water and place chocolate pieces in the double boiler. Heat over medium heat, stirring often. Once the chocolate is melted, use a knife to spread half the chocolate on top of the cake. If desired, use a fork to make swirls in the chocolate. Place cake back in the fridge for about 30 minutes to harden chocolate. Remove from fridge and carefully turn cake over. Top with remaining chocolate and if wish, make the swirls with a fork or leave solid chocolate. Place back in the fridge for about 30 minutes to harden chocolate. To slice the Rainbow Cookies, use a serrated knife to cut the cake. Have warm water in a large cup ready to dip knife in for easy slicing. I prefer 1-inch slices. The almond paste, Odense comes in 8-ounce paste and others brands are in 7-ounce packaging. I have used both. If using 7 ounces. feel free to up the almond extract to 2 teaspoons. The cookie layers can be frozen after step 3 to Assemble the Cookie. When ready to eat, place frozen cookie layers the in fridge to defrost. Usually takes a few hours. continue with chocolate glaze step.